The BA-10 was the result of continued development of the BA series. 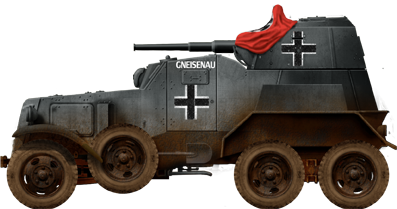 A new chassis was used, and instead of out-rightly adding more armor, the designers actually reduced it, whilst at the same time sloping it, thus giving better effective protection. As a fighting vehicle, it was sophisticated and reliable compared even to international standards, not just other Soviet designs. Despite this, there were developments that would lead to it being replaced with the BA-11. However, this new vehicle was cancelled with the outbreak of war. The BA-10 was in use until 1945. A Soviet officer wields a signal pistol next to a BA-10M. 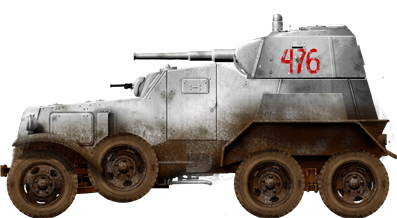 From the late 1930s, Soviet armored fighting vehicle designers decided to use sloped armor in new designs, and redesigned some already made vehicles to take advantage of it. 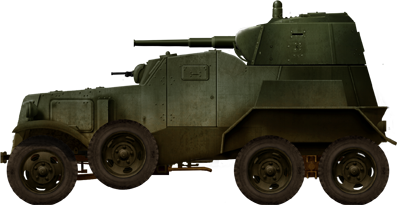 The BA-10 armored car was built on the GAZ-AAA six-wheeled truck chassis, which was a near copy of the Ford Timken design, albeit with an extra axle. It had been modified and reinforced to cope with the extra weight that an armored car would require. The use of a front-engined chassis placed the driver behind the engine, and there was a co-driver’s machine-gun position beside him, which would be useful for frontal engagements. Power was provided by a 50 hp GAZ-M1 4-cylinder water-cooled petrol engine that gave a maximum speed of 55 km/h (34 mph), and a range of 300 km (185 mi), which was highly useful for the heavy scout role. 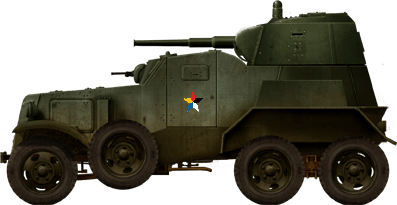 Being a heavy armored car, the vehicle was not always best suited for off-road, but a pair of tracks for the rear wheels was given for crossing bad terrain. The BA-10 used a slightly thinner, better-sloped armor layout than that of the BA-6. This improved protection whilst saving weight, as the sloping increased the effective armor. The majority of BA-10s seen in photos are actually BA-10Ms. The original BA-10 (aka BA-6M) only saw very limited production (if any, aside from the prototype) at the Izhora Factory in April, 1937. However, it seems as though when being serially produced, a number of changes were made. There were plenty of internal wiring changes, and other unseen differences, such as the engine spark plugs being placed in a shielded box, fuel tanks were placed under the roof, ammunition capacity was reduced, and a new whip antenna was added. A column of BA-10Ms in winter camouflage. BA-10 (2 axles) – This was a strange variant produced by plant No. 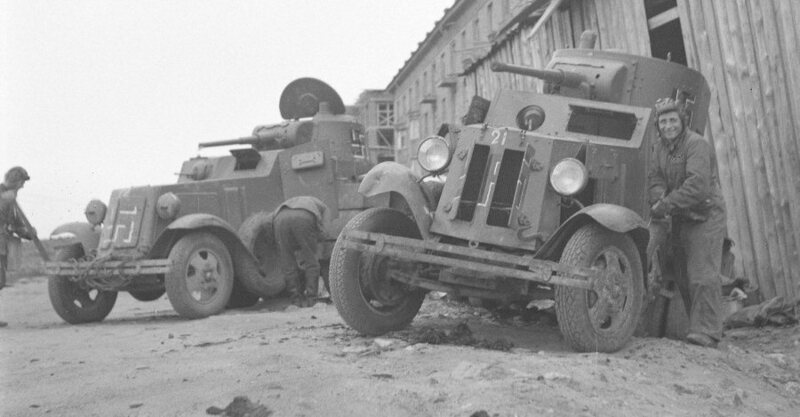 189 in Leningrad in late October – November 1941 because of a lack of GAZ-AAA chassis. BA-10M armored hulls were installed on GAZ-AA and ZIS-5 chassis. At least six were produced. There are no photos of the vehicle based on a ZIS-5 chassis, but the GAZ-AA ones have been photographed. 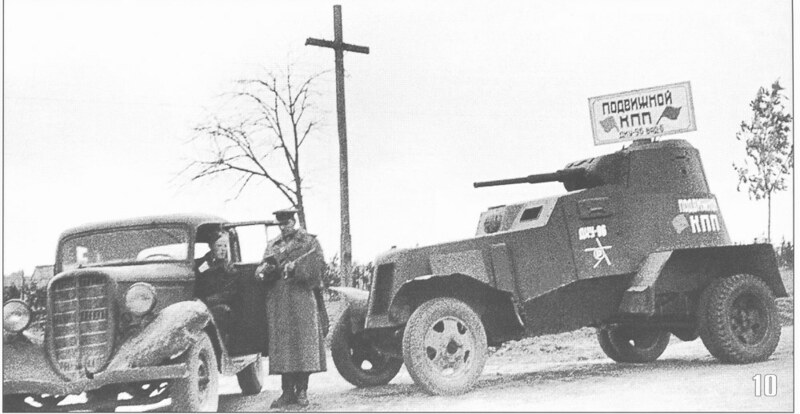 A rare 2 axle BA-10 used as mobile check-point at the 1st Byelorussian Front, autumn, 1944. 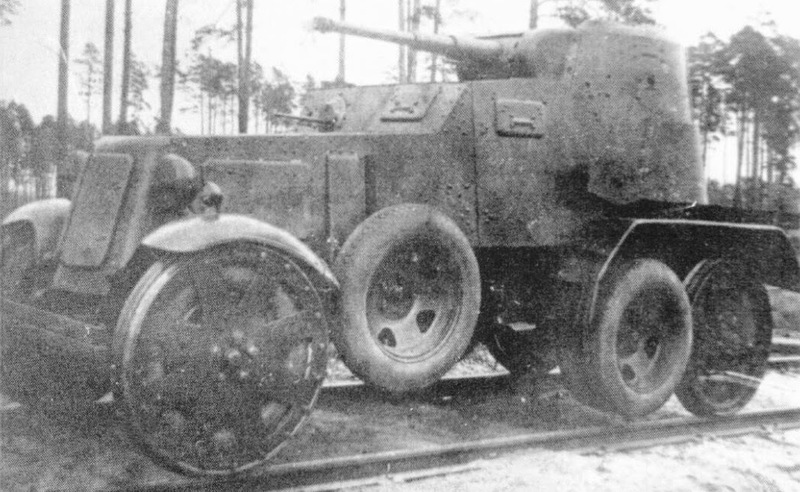 BA-10 ZhD – This vehicle was also very similar to the BA-10, but it also featured set of steel wheels which could be installed, allowing it to travel on road or on railway tracks. When not in use, its steel flanged rail wheels were stowed two at the rear of the vehicle and one on each stub axle located on the engine compartment sides. The BA-10 ZhD had a combat weight of 5.8 tonnes due to the weight of the steel wheels and additional ammunition load carried. A BA-10 ZhD – notice how the wheels fit onto the rail tracks. BA-22 – An attempt at making an ambulance / APC based on the BA-10. It seems as though this never left the prototype stage. 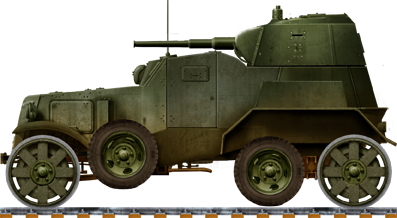 PB-4 – This was an amphibious variant based on the GAZ-AAA chassis, thus making it hardly a variant of the BA-10, and more of a totally different vehicle. 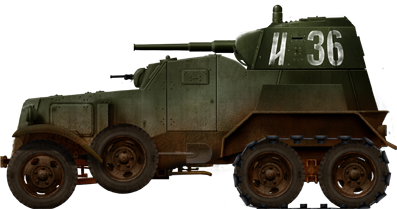 Soviet engineers at the Izhora Factory had had issues with making amphibious armored cars, leading to at least four failed prototypes. They could not climb river banks, as the wheels got stuck in the soft mud. According to an article entitled “Soviet and German advisors: Put Doctrine to the Test: Tanks in the Siege of Madrid” by Dr. John Daley, the BA-10 was reportedly first seen in the Spanish Civil War in service with the Commune de Paris battalion against Panzergruppe Thoma, which had Panzer Is. This is false. He refers to the BA-10s having short 37 mm (1.46 in) guns, when in reality, the BA-10 had a 45 mm (1.77 in) gun. Daley is probably referring to the earlier BAI, or the AAC-1937 (Chevrolet 6×4) which was produced by Spain as a near copy of the BAI. 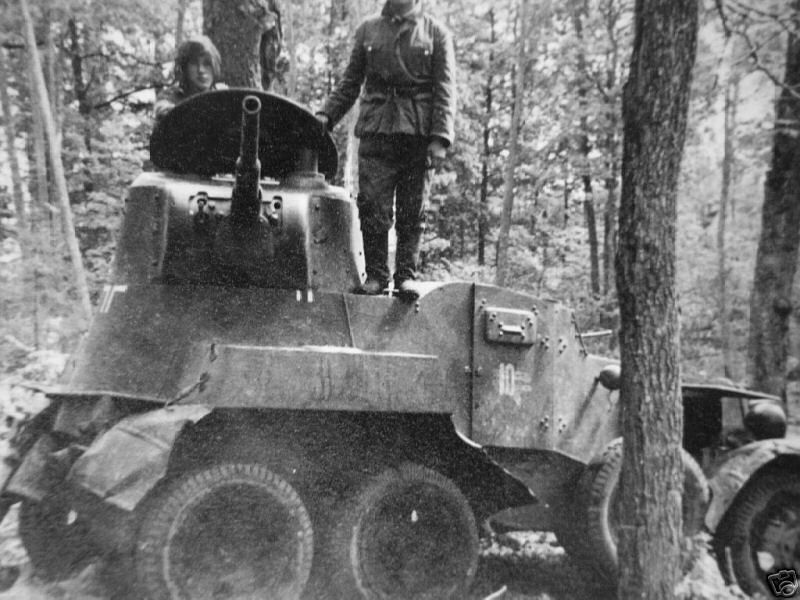 The BA-10 was perhaps first seen at Khalkhin Gol, 1939, where roughly 80 saw active service. However, a number of them were lost, and many photographs of these knocked out vehicles exist. They saw action in all Soviet military operations 1939-1940, such as the invasion of Latvia. The BA-10 was also deployed on the Eastern Front during WWII, but was rarely seen after the winter of 1941-1942. It was usually used as a heavy scout, but it began to lose its role by 1942 to Lend Lease vehicles, as well as the T-60 and T-70. These vehicles had lost their original role to the T-34 (which was now produced in vast numbers), and could therefore be relegated to minor roles such as heavy scout. Some BA-10s were, however, seen in Leningrad as late as 1943. 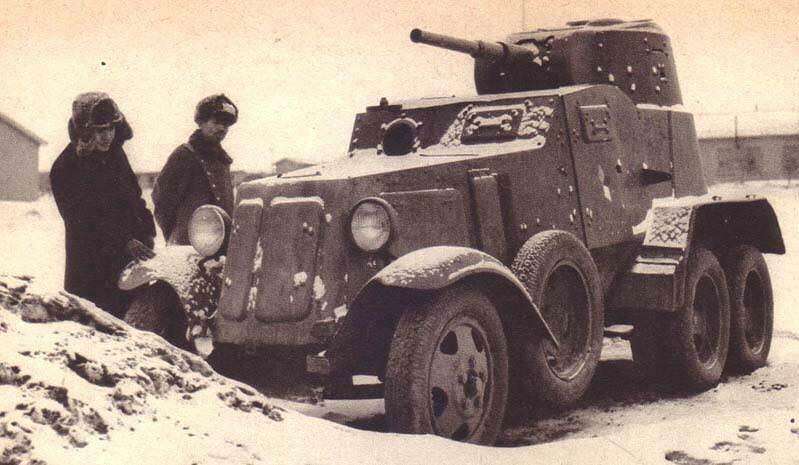 Despite its weight, the BA-10 was a reasonably reliable vehicle and, despite the limitations of its 6×4 drive, served the Red Army well until the German invasion of 1941. 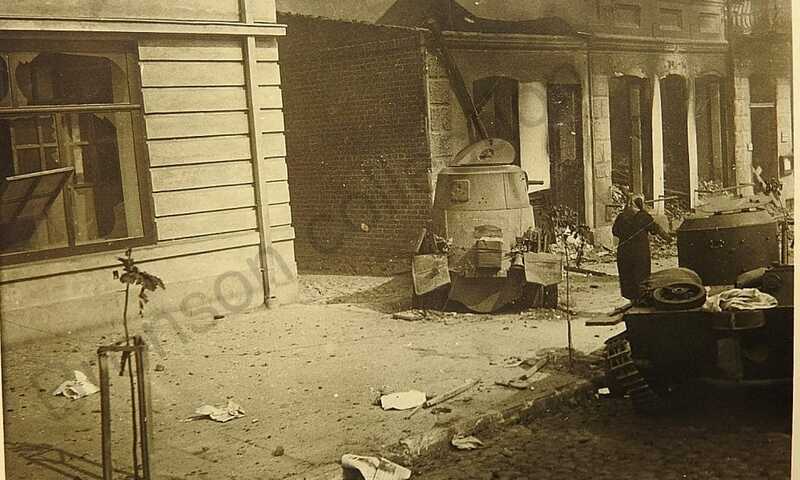 After 1941, few Soviet armored cars survived the early battles with the German Wehrmacht. 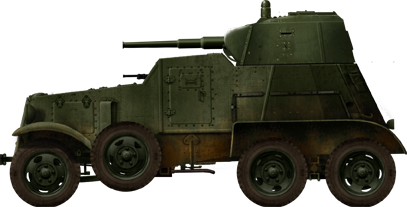 Those that remained in Soviet hands were withdrawn from front line service after 1942, although many would be stripped down to be used as armored personnel carriers. A BA-10M knocked out at Khalkhin Gol. Finland – The Finnish army captured BA-10Ms during the Winter War and Continuation War, and they were designated the BAF C. Detailed information on inventory before June 1944 is scarce, but it appears that roughly 13 were captured and saw service in the Continuation War. 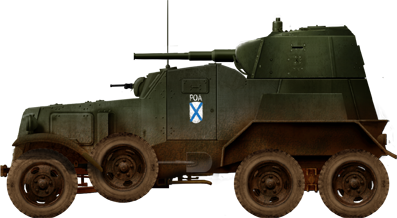 In 1941, they were issued to separate platoons, but were later given to the Finnish Armored Division (Ps.D), and they were used as command, supply and signal vehicles. The Finns actually considered the engine and maneuverability too poor, and replaced the engines with Ford V8 95hp engines. One BAF C was lost in summer, 1944. After WWII, the remaining twelve BAF Cs were used as recon vehicles by different battalions. By 1958, only four remained in service, and were finally taken out of service in 1959. One is on display at the Finnish Armour Museum in Parola. 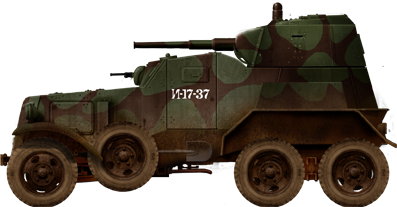 One BAF C was modified as a crane vehicle in 1961 by removing its turret and most of armored hull, it remained in use with the Finnish Army until 1978. A BAF C (left) next to a BAF A (right). The BAF A is the Finnish designation for captured BA-3s. 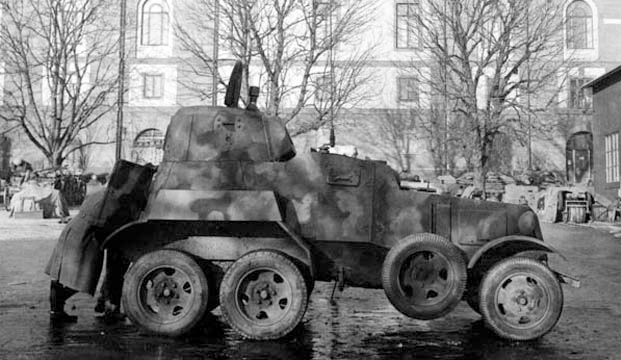 Sweden – In 1942, Sweden requested Finland to send them some captured Soviet heavy armored cars for testing. The Finns sold to the Swedish three damaged BAF Cs and delivered them in October, 1942. They were without engines, tires, and transmission boxes at the cost of 5000 Kronas. 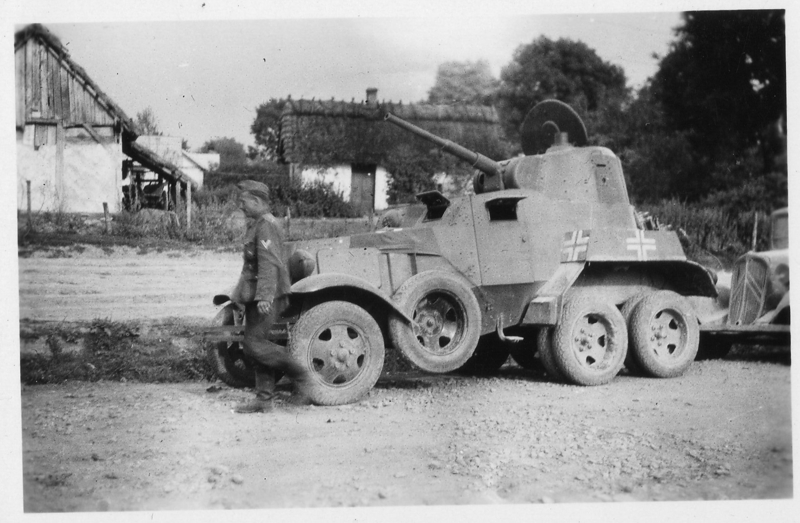 They were repaired, and were given Swedish weapons, such as a Kulspruta M/39 machine gun next to the driver, but it did not feature a main gun in the turret. They also had improved radios, with a new antenna atop the turret. 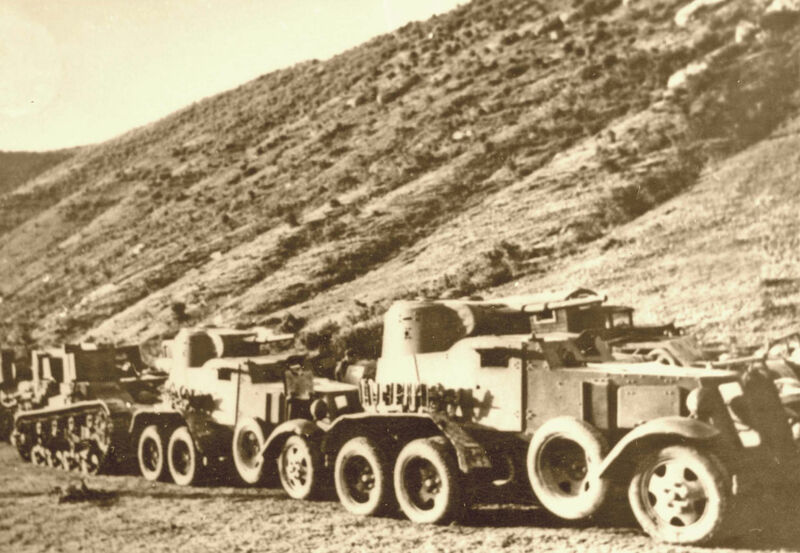 These were designated Pansarbil M/13F, and remained in service until the 1950s as command vehicles. One remains at the Swedish Tank Museum in Skövde. 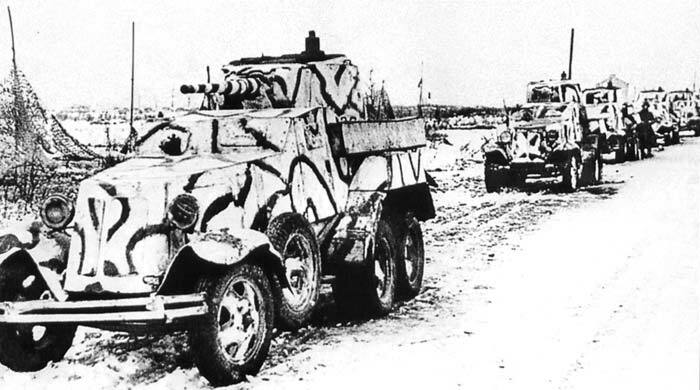 Germany – Large numbers of these vehicles were captured, and the Germans used them for anti-partisan duties both in the USSR and in the Balkans; a role in which these vehicles excelled. 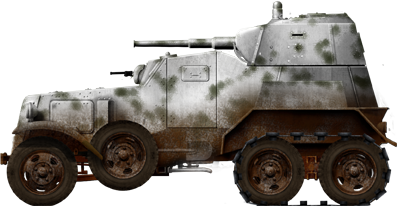 The German-allied ROA was reported to have used some against the Red Army during the liberation of Prague. Nationalist China – After the heavy losses in 1937 at the Battle of Shanghai and the Battle of Nanjing, the KMT appealed to the USSR for arms sales. As a result of the Sino-Soviet Non-Aggression Pact, signed in August, 1937, the USSR began supplying the KMT’s newly formed 200th Division with Soviet equipment. 83 T-26s were sold, along with small, but unknown numbers of BT-5s (at least 4), BA-27s (at least 4), BA-3/6s (unclear which model, at least two), BA-20s (unclear which model), and possibly some BA-10Ms (which are possibly misidentified BA-3/6s). Manchukuo – The Imperial Japanese Army captured many Soviet weapons at the Battle of Khalkin Gol. Among them was at least one BA-10M, which was transferred to the Manchukuo Imperial Army, as proven by a photo showing one with a military star version of the ‘Five Races Under One Union’ flag. BA-10M of Manchukuo Imperial Army, February, 1940. On the crew door is a military star version of the ‘Five Races Under One Union’ flag. 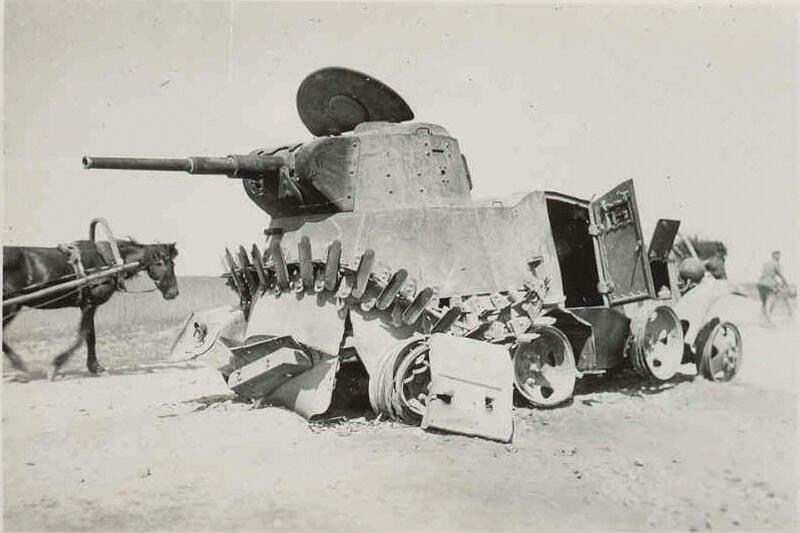 This vehicle was captured by the IJA at Khalkin Gol. BA-6M, testing the newly developed sloped turret in 1937. Only a handful entered service before the production was shifted on the BA-10. BA-10M in regular olive green livery upon entering service in 1939. BA-10 with two axles used as mobile check-point, 1st Bielorussian front, October 1944. BA-10ZhD, the rail conversion variant. BA-10M of Vlasov’s Russian Legion, 1942. 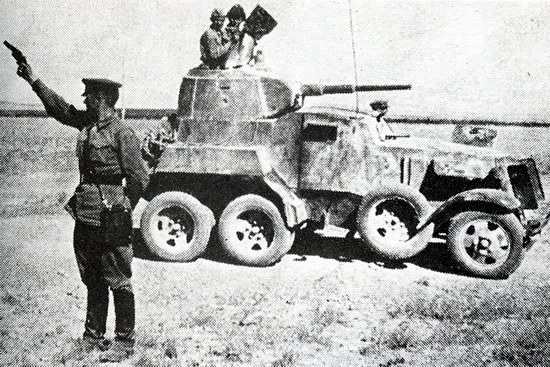 BA-10M, reportedly in service with the Chinese Nationalist 200th Division, in 1938. Speculative colors only, as this is likely a mis-identification of a BA-3/6. BA-10M of the Manchukuo Imperial Army, circa February, 1940. This vehicle was originally captured at the Battle of Khalkin Gol by the Imperial Japanese Army. Some BA-10Ms in Romania. A few T-26 M1931s, and seemingly an OT-26 can be seen behind them. A BA-10M with a British column in Iran. A Pansarbil M/13F in Stockholm, Sweden. A knocked-out BA-10A (from the first lot of 60 vehicles) next to a T-38 light amphibious tank somewhere in a Soviet city. Source: Bronson, British Collectors of Arms & Militaria Forum. Ukrainian BA-10M of Vlasov’s Russian Legion, 1942. – non sence – why Ukrainian? I suppose, that Russian legion obtained armor later, had some in Prague 1945. Some BA-10s in Romania. A few T-26 M1931s can be seen behind them. – maybe the first T-26 have only one turret and it’s OT-26. Indeed, i think there was a mismatch with the Ukrainian Liberation Army perhaps because of the badge in the reference. Vlasov’s Russian Legion was not operating in Ukraine. The sentence was modified, thanks to highlight this. Your description of the improvements with BA-10M is innacurate. Also, the “extra fuel tanks being placed on the rear bumpers” were not “extra.” That said, most of your “BA-10” in the images are actually “BA-10M”. Not to mention that all of them were produced either as “BA-10A” or “BA-10M”. No “BA-10”. The BA-21 was not “An attempt at making an ambulance / APC”. It was a completely different vehicle that has nothing to do with BA-10. try to find new and more accurate sources. Thank you for your comment, we have further checked the information in the article with Steven Zaloga’s “Soviet Tanks and Combat Vehicles of World War Two”, Solyankin’s “Отечественные бронеавтомобили 1905-1941”, and made corrections. We have many sources, and our ‘archive’ is growing every week – If you have any particular problems with any that we have used, or if you have any that you could recommend, that would be appreciated. 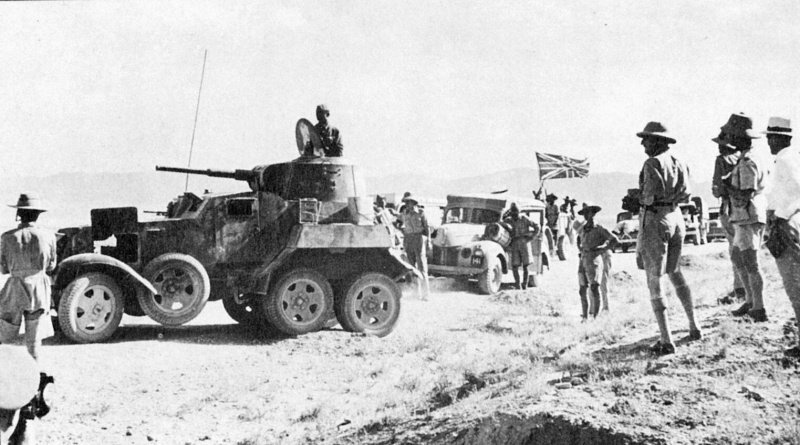 The BA-21, was, indeed, a different vehicle – an improvement of the BA-20 but with a heavier chassis. The armoured ambulance was actually the BA-22. “BA-10A” isn’t a designation that we are familiar with, and only appears in one of our sources (the statusreport blog), and very rarely on the internet. Perhaps you have a source that you could show us for this? The description of the BA-10M, is, indeed, incorrect. With regards to the illustrations and captions, I would have to ask the illustrator about that, as they are done separate from the article. All of the colored illustrations depicting BA-10M (except the top one). Almost all the photos have BA-10M as well. 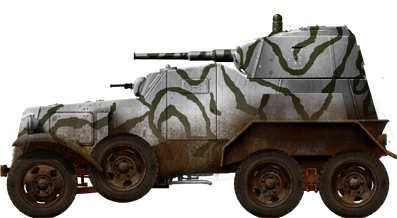 BA-22 was based on the chassis of the same truck as BA-10 was – the GAZ-AAA; but it was not based on BA-10 and has nothing to do with it. No BA-10 were manufactured under the actual designation “BA-10”; it happened because by the time the first vehicles came out of a production line, there were so many changes made to the original design, that the designation was changed to “BA-10A”. “Soviet Tanks and Combat Vehicles of WWII” by Steven Zaloga and James Grandsen was published in 1984, when even the Soviet researchers didn’t have good access to the wartime archive, so one can only imagine how unreliable this book is. “Tanks and Other Armoured Fighting Vehicles of World War II” by B.T. White – same thing. Just give it to some 7-year-old kid; he will like it. “Отечественные бронеавтомобили 1905-1941” by A. G. Solyankin – also outdated; lots of inaccurate information based on authors’ guesses rather than a documented hard evidence. Don’t know about “Weapons of World War II” by Alexander Ludeke, but I would expect it just repeats the previous fairy tales written in 1970’s-1980’s. 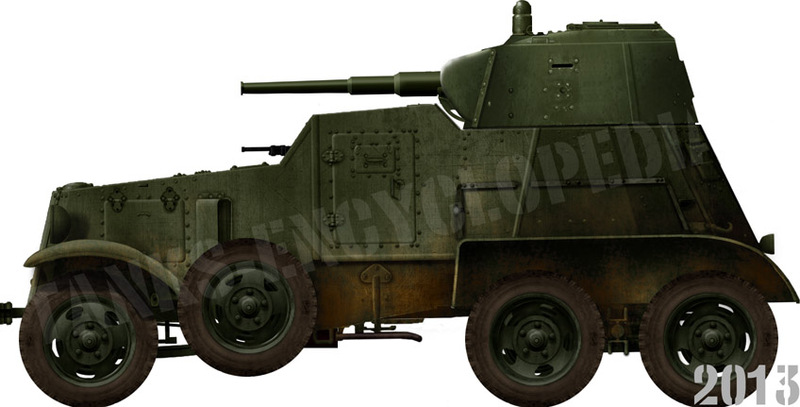 The most accurate and reliable book on the Soviet armored cars to date is the “Броня на колесах. История советского бронеавтомобиля 1925-1945 гг.” by Maksim Kolomietz. The book was re-published in 2012 under the title “Бронеавтомобили Сталина. “Золотой век” бронемашин.”, but unlike the original edition it lack some illustrations including the blueprints. We have managed to get our hands on the books suggested by you and one of our members will be going through it checking the information you provided. BTW, the truck GAZ-AAA was a “near copy” of Ford-Timken, not Ford Model AA. And there are plenty of other things you need to correct here (just like in your other articles). Armor history is a very complicated topic. Looked here onto photos of BA-10 – maybe someone know photos with this vehicle with Red Star symbol? I only saw one model inspiration where this symbol is on doors. Thanks David, I’m not specialist at all in Russian armour – jet want to finish model to Bolt Action system and want to do it correctly. Our Soviet connoisseurs have both stated that they didn’t ever see a BA-10 with the Red Star on it. Few of these vehicles were camouflaged (except for the occasional white-wash) and even fewer have any divisional markings. 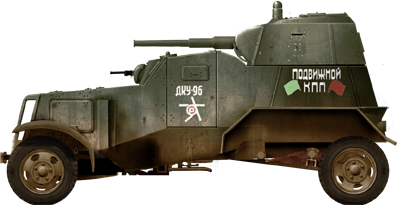 I put simple camouflage – one colour – as I guess most Russian vehicles of that time had. Many thanks for your answer. I did some more digging on this, because it got me thinking. I’ve found this photo of a Beute BA-10 which appears to show the remnants of a red star on the door, under the probably newly painted number. That’s the best I can find. Indeed, a green livery with no markings was most common. Well, it may be a former Red Star, or you may just be seeing it because you want to. Interesting photo, I guess it could be Red Star or as Stan Lucian say below we imagine that it was Red Star 😉 . Now I leave model without any markings, need to do some more investigation.